Here's a roundup of everything we know so far about Anthem DLC, including release dates and more. The launch of Anthem is barely behind us, but BioWare has already detailed the full DLC release schedule for the game, for the upcoming year. In this Anthem DLC guide, we'll be recapping and expanding upon that schedule for you right here, so you've got all the information you need to know about when new content is going to arrive in the world of Bastion. However if you instead need any additional information on Anthem at all, you can always head straight over to our Anthem beginner’s guide. Here you can find a full story primer for the game, as well as an overview of all four Javelin classes available. BioWare and EA plan for Anthem be an evolving, changing game, maintaining player interest over multiple months. DLC for Anthem is going to come in the form of ‘Acts,’ which is another way of saying seasonal events. Below, you can see the overall gameplay calendar for what we can assume will be a year of Anthem post-launch content. 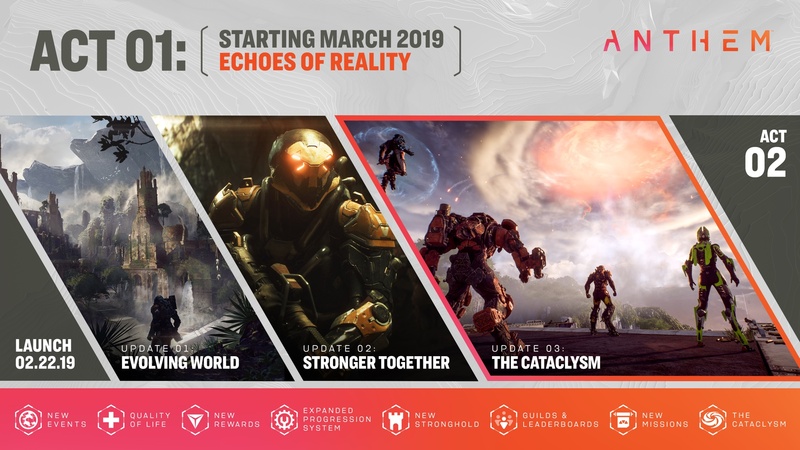 The schedule above tells us that there will be three Acts for Anthem, with the first launching in March. Currently, we’re not sure how long an Act will last for in Anthem, and we’re also not sure if this content will be paid for, or free for all players. The first Act for Anthem is the ‘Echoes of Reality,’ and kicks off in the month following launch. You can check out the graphic from EA just below, for an overview of the content we can expect during the debut Act. 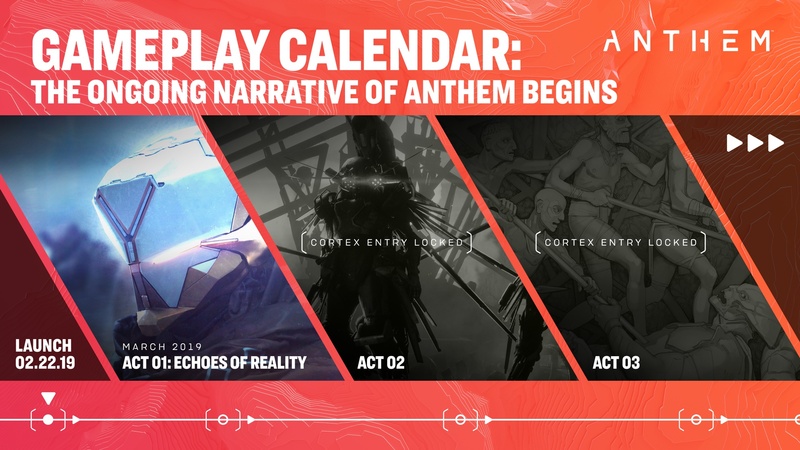 Act 1 for Anthem is split up into three sections: Evolving World, Stronger Together, and the Cataclysm. We’re not yet sure what the first two parts refer to, but we do know that a Cataclysm in Anthem is a limited time, live event within the world. Back in the public demo for the game, it took the form of a giant storm in the sky, and a number of huge Ancient giant enemies were spawned into the world for players to take on in groups. If we look closer into Act 1 for Anthem, we can get a rough idea of the content that will be arriving in the game after launch. Just below, we’ve rounded up every new addition to the game confirmed to arrive at some point during Act 1, explaining, where we can, what each new addition is. New Rewards - New weapons and armor items. Expanded Progression System - New difficulty levels and an increase on the level cap. New Stronghold - Strongholds are enemy forts that you can invade as a group of four players together. Guilds and Leaderboards - A Guild in Anthem could function like a Clan in Destiny, where rewards are shared out between all players. New Missions - BioWare previously revealed that the story of Anthem would be progressing even after launch, so we can expect some new story missions. The Cataclysm - A world-changing event in-game, with powerful enemies and rewards. As of right now, this is all the information that we have on DLC coming after launch for Anthem. We’ll keep this guide completely up to date with all the latest information, so that if EA or BioWare announces new content, you can read about it here straight away. For now, you can check out our additional coverage of Anthem here at USgamer. You can head over to our Anthem Colossus Javelin guide, or our Anthem progression guide for more.